The fitness-tracking Jawbone UP has its share of problems. (It dies!) Jawbone is offering refunds, but it also created a big opening for competitors. 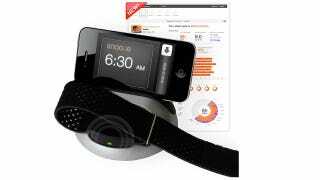 Like LARK, which is offering free sleep trackers to anyone willing to trade-in a Jawbone UP. While Jawbone is giving people their money back, it's also had to stop shipping. Which means you basically are out of luck if you want one before the holidays. Enter Lark, which says if you mail it your busted Jawbone UP, it will send you a new Lark sleep tracker. And it also gets in a dig while it's at it. We get why you got a Jawbone UP. You want a healthier life and a better night's sleep, and you want it now. Awesome. We're with you all the way. That's why we want to give you a free LARK — so you can start sleeping better this holiday season.